The Screenplay for the ‘Entourage’ Film is Finished!!! Find Out What It’s All About!!! 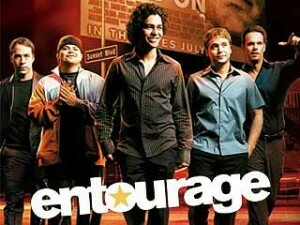 Most of knew that the guys from HBO’s ‘Entourage’ were not done by any means telling their story. Creator Doug Ellin has been hard at work for a while on a film script for the show. One year ago, the series ended on HBO with agent Ari Gold offered a job as the head of a movie studio. Of course, that sets up a film, and with Ari in charge, he can give anything to Vince. According to Deadline, Ellin is on page 110 of the script and will be finished by this weekend. Ellin says the script starts about 6 months after the TV series leaves off. “There are interesting developments about Ari as a studio head, and that’s still the first page for me. But foremost is the friendship between the guys who are still hanging out and going to fun parties, and it continues with the same characters.” I would imagine this would hopefully be a rated ‘R’ film and I hear that Ellin has kept in touch with the entire cast, and they are all ready to come back to their characters for a big screen adaptation. This series was a lot of fun, but I felt like everything was said and done with these characters. Where could it go from here? Don’t get me wrong, the series and characters were fun to watch, but I just don’t see where it can go. Kid Cudi Joins Big Screen Cast of ‘Entourage’!!! Haley Joel Osment Joins ‘Entourage’!! Lifetime Pushing Two Original Series Into High Gear – Selena Gomez & Shakespeare?!?! This entry was posted on Wednesday, September 12th, 2012 at 11:49 am	and is filed under Film, News, Television. You can follow any responses to this entry through the RSS 2.0 feed. You can skip to the end and leave a response. Pinging is currently not allowed. « John Carpenter’s ‘They Live’ Bluray Collector’s Edition Announced and Detailed!!! Never send a boy to do a woman's job.